OK, this has been bugging me for a long time... According to our cookery teacher at school, chocolate contains three ingredients: cocoa, sugar, and milk. If you mix these together, you can "make chocolate". Cocoa powder, by itself, tastes sharp, bitter, and repulsive. Cocoa powder does not disolve. The drink tastes absolutely terrible. No amount of sugar makes it stop tasting bitter and horrid. Even adding peppermint, vanilla, or similar still fails to mask the awful taste of the cocoa powder. In short, as far as I can tell, cocoa is nothing like chocolate. And yet it's supposedly the most important ingredient...? Clearly something is missing from my understanding here. Can anybody explain? Probably related: When you buy chocolate-flavoured products, sometimes they taste like chocolate (i.e., delicious), and sometimes they taste like cocoa (i.e., inedible). Why is that? PS. I'm not trying to actually make chocolate. (It's not like it's hard to just buy the stuff!) I just want to understand what the difference is. When making chocolate the cocoa beans are fermented, roasted, and crushed/ground. They are then sent through huge presses that separate the cocoa butter from the cocoa powder. Chocolate is cocoa butter that has been emulsified with varying quantities of powder and usually a ton of sugar and sometimes milk. The rolling of the chocolate with the butter to enhance the texture is called conching. Cocoa powder will dissolve in liquid if you mix it into enough sugar beforehand- this is how chocolate drink mixes are made. 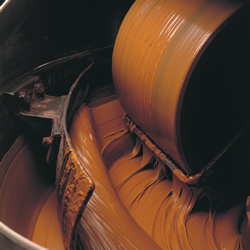 Additionally chocolate is smooth and creamy because of the unique properties of cocoa butter. It can be tempered to form crystals that are solid at room temperature but melt at body temperature. This makes them smooth and melt in your mouth. Another reason, besides unwholesome quantities of sugar, why cocoa powder is more harsh tasting than chocolate, is that chocolate has often been dutch processed where cocoa powder often hasn't. Cocoa is naturally acidic and harsh tasting. Adding some alkalinity to balance its pH makes it much softer tasting- and darker in color. You can buy dutch processed cocoa powder. Remember that some recipes need to be altered to use it- for example if the recipe called for baking soda you would have to use baking powder instead to maintain the correct pH. Cocoa by itself is chocolate flavoured, but bitter, not at all sweet. 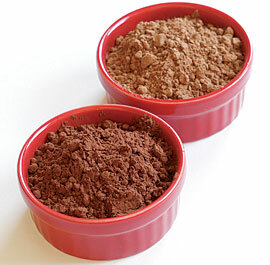 The difference between cocoa powder and, say, Cadbury's Dairy Milk is a whole load of added milk and sugar. Milk chocolate is normally only about 20% cocoa solids, whereas dumping cocoa in a mug of hot water and adding a few teaspoons of sugar would make it more than 90% cocoa solids. I have quite a sweet tooth, so, like you, I prefer milk chocolate to chocolate with a very high cocoa content (dark chocolate), but lots of people would say that the higher the cocoa content, the purer and better quality the chocolate. As for your drink, try forming a smooth paste from the cocoa powder and the milk, top it up with hot milk, then add sugar to taste.